Pen Pals & Picture Books: Thanks alot, DAVID! Any of you remember seeing this photo in my gingerbread house making post? 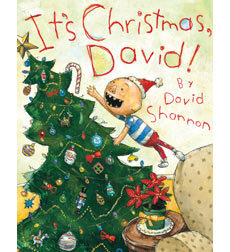 Well he's my four year old (we'll call him Bibs) and he thinks David, the main character of several David Shannon books, is hilarious and wonderful (Whitney talks about David here, you should take a look). This photo kind of shows either why Bibs can so readily relate to David or maybe that David's had quite an influence on Bibs... I'm not sure. Either way- it's a fact that Bibs has a very favorite Christmas book. If you aren't familiar with David you should know that he's a character who's often getting into mischief. It's not that he wants to be bad... more like he's spontaneous and not very aware of consequences. He really lives in the moment. And so does Bibs. ... and it's really funny. Filled with ridiculous things like "#117. 100 Cheeseburgers" (seen below). yes, it nearly reaches to the floor, and yes- it's filled with silly things. Another thing about Bibs is that he knows (and admits) that he's probably not always on the good list. In fact he says he wants Santa to bring him some coal. These words have come out of his mouth "Santa should bring me a lump of coal because sometimes I'm naughty." Good news, Santa picked up some coal at the store yesterday. How many of you have noticed that books (and characters in books) can really have a big influence on kids? One day while I was perusing Silly Eagle Books (a site I simply adore) I stumbled upon her 'things I blame on books' page. It's really hilarious and similar to what we've got going on here, you should definitely go see. So you may be wondering how I feel about David now. I still love him and I still love Bibs... though I may need to put David away for a while after Christmas. Any ideas on who I should introduce instead? Perhaps a very well behaved ,sweet and obedient character? Let me know if you've any ideas.